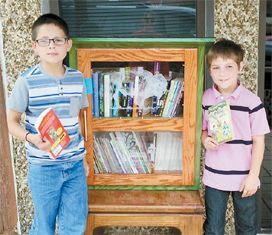 Tyler and Jake Price are the first customers of the BISON Little Free Library in Leedey. Connie Quattlebaum is the Steward of the BISON Little Free Library. It is located on the map of the organization’s website. The new library is located in front of Leedey Gas & Oil.